Sony a5100 is often considered as a budget version of the more expensive Sony a6000. Available just under five hundred bucks, it packs strong punches. It offers exceptional output quality for the price. It offers more than just decent performance. Nevertheless, some people who have met Fujifilm X-A2 wonder if the product can be an even better choice, considering that they can save quite some by going with Fujifilm X-A2. Thus, the aim of this product comparison is to determine whether Fujifilm X-A2 or Sony a5100 makes the best value for our money. Continue reading! First, we need to know on what things the two models are similar. Both Fujifilm X-A2 and Sony a5100 support wireless connectivity for easy and practical file sharing across various devices. They both have articulating screens so that you can get more flexible shooting positions with either of the two. No matter on what angle you are shooting your object, you can adjust the screen so that you can still see precisely what you are shooting. Both models have 920k dots of display screen resolution (Sony a5100’s is actually a little bit higher with 922k dots, but this is perhaps somewhat trivial). Both models come with built-in flash, RAW support, and auto face detection. You would like to choose Fujifilm X-A2 only for the better flash performance. Unlike Sony a5100, it has an external flash shoe, so you can implement flash from a better angle without causing the red-eye effect. It also has a considerably longer flash coverage, 7m compared to 4m. Last but not least, it also has larger pixels so that it can have better dynamic range. Have a look: Fujifilm X-A2 vs Sony a6000. You would like to choose Sony a5100 for the overall better performance, wider functionality, and possibly better output quality. While Fujifilm X-A2 only has a 16MP image sensor, Sony a5100 boasts a 24MP APS-C sensor. It also comes with 130 more focus points, totaling with 179 focus points, with up to +3 and -3 EV AE bracketing range. Thus, Sony a5100 is able to produce larger, sharper, and more detailed images than Fujifilm X-A2. Sony a5100 is also better than Fujifilm X-A2 for HDR photography. Additionally, Sony a5100 has a slightly faster continuous shooting speed (6 fps vs. 5.6 fps), so it does have a marginally better edge for fast-paced photo shooting. Unlike Fujifilm X-A2, Sony a5100 supports time-lapse recording as well. While both models support Wi-Fi, only Sony a5100 that comes with NFC technology for extreme practicality of file transfer with compatible devices. 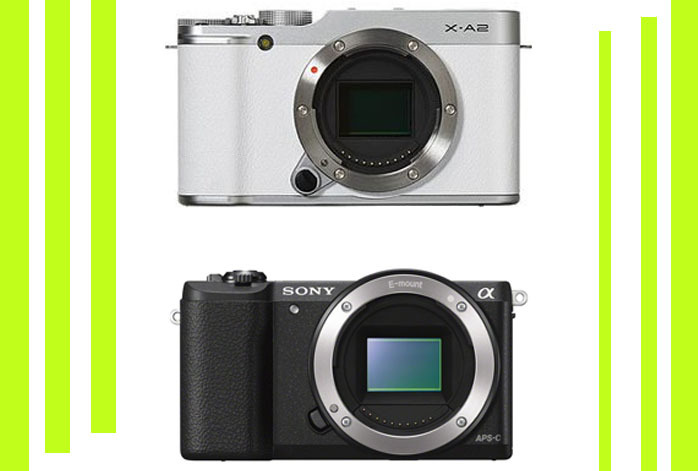 Last but not least, Sony a5100 is quite more compact and lighter than Fujifilm X-A2. In general, Sony a5100 makes a better choice than Fujifilm X-A2 because it offers much better functionality, performance, output quality and connectivity, even though its flash feature is not very good because of the lack of an external flash shoe. Anyway, this is just a minor weakness, and Sony a5100 still holds more value!